rob 30/07/2015 Comments Off on Electricity prices will continue to rise, so what’s the answer? It’s bad news, inflation busting electricity price rises are set to continue for some time. But there are ways to reduce the pain says Rob Such. There has, quite rightly in my opinion, been a lot of negative press recently regarding the above inflation increase in electricity prices we face again this winter. I get a sense of déjà vu as we saw the same thing happen last year and the year before. You could be forgiven for thinking that after several inflation busting rises electricity prices will level off for a while over the next few years. I have some bad news for you. Electricity prices will continue to rise at above inflation for years to come. Take a look at the graph below of electricity prices published by Eurostat. It doesn’t include the latest prices rises announced in the last couple of weeks. 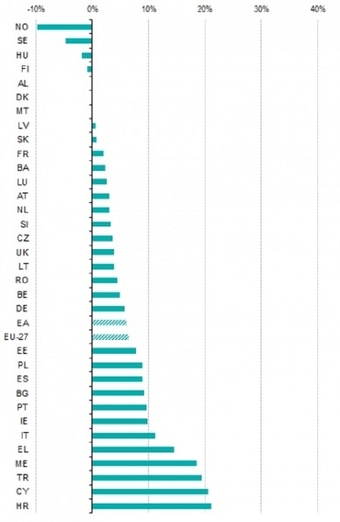 But even if you factor these in you can see that the UK has some of the lowest electricity prices in Europe. The UK has lower than EU average price for electricity, France is the only similar sized economy with lower prices due to a socialist government and lots of nuclear generation. As a nation we have enjoyed low energy prices for many years, the industrial revolution was built on cheap energy from coal, then we discovered oil in the North Sea making us self-sufficient in energy for a while. However we are not self-sufficient anymore. The UK is now dependent on the same imports of coal and gas that many of our European neighbors are, market forces mean our prices will rise to match theirs as we all bid for the same limited resources. This will only get worse as the European economies recover from the recession. Our electricity prices will rise to catch up with Europe, but this is a moving target. Energy prices are rising in other countries as well and at a faster rate than ours as you can see in this next graph also from Eurostat which shows year on year prices rises from 2011 to 2012. So what is the answer? The British Government has persuaded the Chinese to pay the French to build us a new nuclear power station at Hinckley Point by offering a big subsidy for the next 40 years using a guaranteed minimum price. There are big hopes for fracking but it is likely that the small scale and more onerous planning and environmental protect won’t bring the cheap gas bonanza that the USA has seen. To better control electricity prices we need to do two things. First reduce demand, rising prices mean industry and householders alike are replacing lighting and machinery with more energy efficient models. The higher the electricity price the greater the saving. Secondly we need to go back to being more self-sufficient, as a nation we have some of the strongest winds and largest tidal ranges in the world. We are only just beginning to exploit these natural resources. Many businesses are installing small scale generation systems to reduce energy bills. This is an effective way to hedge against rising electricity costs. Energy price inflation is more than offsetting the reduction in financial support from the government for most renewable energy technologies. We are heading towards grid parity faster than you may think.